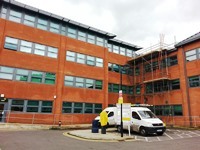 Services / facilities within the building include Science, Art, Media, IT and Languages. 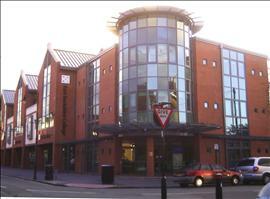 This venue is situated in Windsor. The nearest mainline station is Windsor and Eton Central. 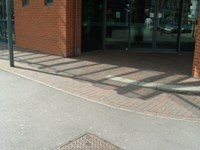 There are 7 designated parking bay(s) within the car park. 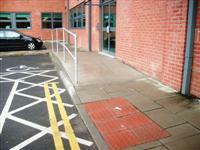 The dimensions of the designated parking bay(s) are 500cm x 320cm (16ft 5in x 10ft 6in). The nearest designated bay is 8m (26ft 3in) from the rear entrance. 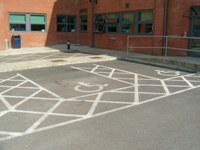 The furthest designated bay is 13m (14yd) from the rear entrance. Blue Badge parking is free of charge and the badge must be clearly displayed. Visitor parking is by permit only which is available from the main reception and must be clearly displayed. All other parking is pay and display and the parking control is administered by The Royal Borough of Windsor and Maidenhead. The door opening is 172cm (5ft 8in) wide. 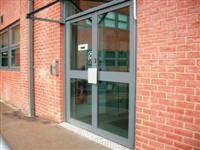 You are on Outside Access (Student Entrance). Skip to the next section. This information is for the entrance located on St Leonard's Road. 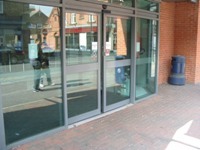 The door opening is 178cm (5ft 10in) wide. You are on Level Change (Student Entrance). Skip to the next section. This information is for the entrance located off the car park. This entrance requires a swipe card to access. 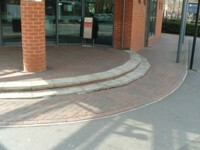 The ramp or slope is located either side of the entrance. You are on Reception (Enquiries). Skip to the next section. 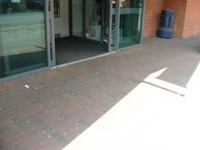 The reception desk is 4m (13ft 1in) from the main entrance. Portable hearing loops are available to use on request. You are on Reception (Security). Skip to the next section. 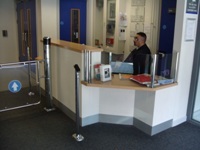 The reception desk is 5m (16ft 5in) from the Student Entrance. 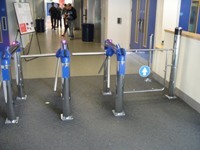 There are turnstiles, 56 cm wide leading from the student entrance to the main part of the building. A swipe card is required to access these. 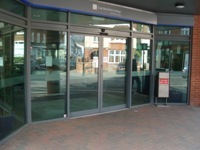 There is also a gate available, 99 cm wide, which is opened automatically from reception. There are several portable hearing loops that are available for use throughout the Centre. The details here are for the stairs next to the main entrance. 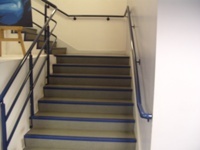 There are two identical staircases at the end of each corridor. The lift is located just past the Security Reception. 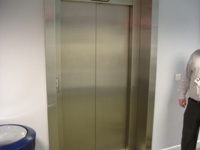 The floors which are accessible by this lift are G-1-2-3. The lift is 12m (13yd) from Student Entrance. The dimensions of the lift are 125cm x 137cm (4ft 1in x 4ft 6in). 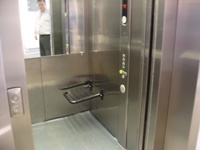 The lift has a fold down seat which is at a height of 50cm. 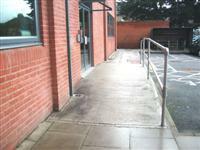 The accessible toilet is 15m (16yd) from the Student Entrance. The accessible toilet is located opposite the lift. The dimensions of the accessible toilet are 238cm x 245cm (7ft 10in x 8ft 0in). The lateral transfer space is 94cm (3ft 1in). 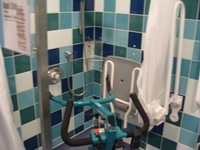 The adapted toilet also contains a roll-in shower, with lever controls and a fold down seat at a height of 50cm. 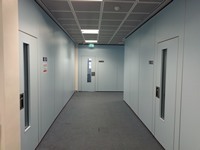 There are additional adapted toilets located on the first and second floors. The female toilets are located opposite the lift. The female toilets are 18m (20yd) from the Student Entrance. The male toilets are located opposite the lift. The male toilets are 13m (14yd) from the Student Entrance. There are additional standard male and female toilets located on the first and second floors. A member of staff trained in BSL skills is generally on duty. 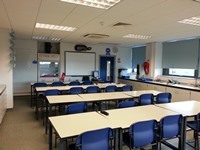 Staff are trained to BSL level 3.